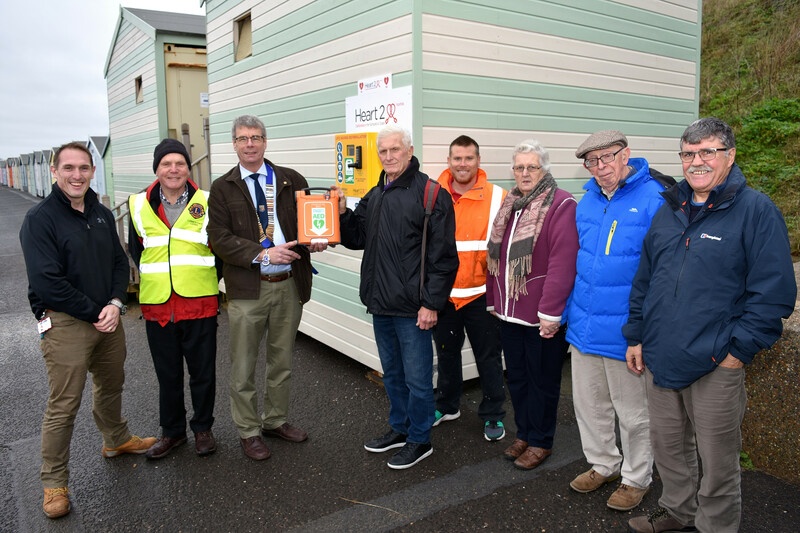 A life-saving device available for the beach hut community to use in the event of an emergency has been installed in Pakefield. Mr Terry Watson secretary of (SLBHA) said “In recent years more beach huts have been sited here and it become very popular with a lot of people coming here in the summer and we want to make this as safe an area as it can be. It is quite a distance to the nearest defibrillator on the seafront at the Beach Officer’s hut with the next nearest being at Pakefield Church Hall or in Pakefield Street near to the Tramway. If anyone has a medical emergency on the beach and there has already been a few incidents, it is a quite a distance to go to get it. South Lowestoft Beach Hut Association (SLBHA) has over 70 members and represents and gives a united voice both for council hut hirers as well as privately owned hut users from Pakefield to Claremont Pier. They aim to make the sea front even safer and pleasant for everybody.